UV systems consist of an ultraviolet lamp and reaction chamber, installed inline into the incoming water source. Units are commonly installed alone or with the UV lamp after a sediment prefilter. Common usages include: whole-house well water treatment, lake and springwater treatment, small commercial applications, laboratory and undersink drinking water disinfection. 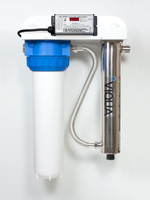 VIQUA brand disinfection systems, formerly marketed as Sterilight and UV MAX. Top quality undersink and whole house units featuring stainless steel reaction chambers, high dosage UV lamps, a wide range of accessories and industry leading build quality. 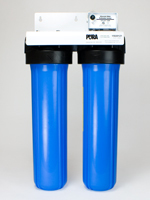 Pura brand ultraviolet systems are available for whole house and undersink point of use applications. Pura systems incorporate sediment & carbon prefilters and are reliable and affordable complete whole house filteration systems. We carry a full range of Pura units, replacement parts and lamps. High quality stainless steel ultraviolet units. 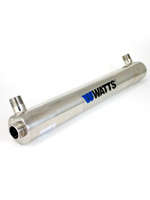 Simple to install and service, Watts UV units provide an affordable and effective option for safe, chemical free disinfection of microorganisms.